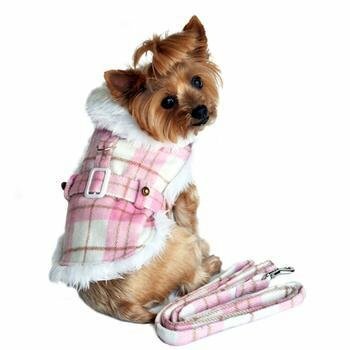 Our Amazing New Classic Pink Plaid Coat is PURE Luxury and High Fashion. We spared no expense and used Very High Quality Wool Blend with a beautifully designed pink plaid print.Harness style with touch fastener Neck and Chest Closures. It Comes with Matching Leash and D-Ring for easy leash attachment. Made with super High Quality Wool Blend and Lined with White Minky Plush Fur. NEW !! Fiber Filled added for Extra Warmth !